Wholesale Trader of a wide range of products which include star anise and cassia bark. Being a well-known firm, we are engaged in offering a large range of Star Anise to meet the needs of our customers. It is a star-shaped, dark brown pod that contains a pea-sized seed in each of its eight segments. Native to China, star anise comes from a small evergreen tree. Its flavor is slightly bitterer than that of regular anise seed. Star Anise offered by us is of supreme quality and are sourced from trusted vendors available in the market. It's available whole or ground and used to give a licorice flavor to savory dishes, particularly those with pork and poultry. As a reputed firm in the market, we are involved in offering our valued client supreme quality Cassia Bark. We are devoted to giving our customer best quality product. 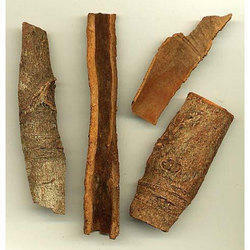 Cassia Bark has a very superior aroma and excellent taste. These are rich in taste and have very distinctive and mesmerizing aroma. This can be used in a variety of recipes like in making dal or using it with vegetables. It is supplied in airtight packaging so that it is always fresh.